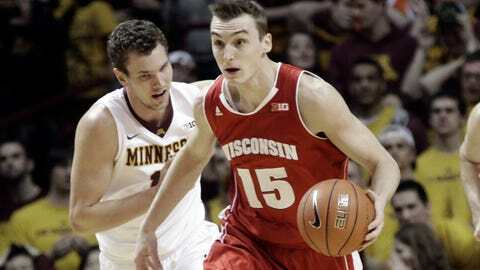 DeAndre Mathieu and Mo Walker led Minnesota with 18 points on Wednesday, while Sam Dekker (pictured) led Wisconsin with 20 points. MINNEAPOLIS — Things couldn’t have started any worse for Minnesota. Andre Hollins hurt his left ankle just 16 seconds into the game and didn’t return. The Golden Gophers have a lot more to offer than just their leading scorer, though, as ninth-ranked Wisconsin was reminded. DeAndre Mathieu and Mo Walker each scored 18 points, an outside-inside combination that pushed the Gophers to an 81-68 victory Wednesday night over the Badgers, who took their third straight loss. "We’ve got very good chemistry. 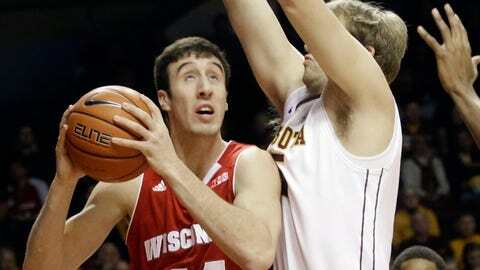 When things are clicking, it’s tough to overcome," Minnesota coach Richard Pitino said. "I think these guys truly believe that the whole is greater than the parts." Malik Smith added 14 points, including the exclamatory, shot clock-beating 3-pointer with 39 seconds left. Austin Hollins had 11 points and four steals for the Gophers (15-5, 4-3 Big Ten). Walker grabbed nine rebounds, and Mathieu went 8 for 13 from the floor. "Nobody likes the Badgers. We’ve always got to beat the Badgers," Walker said. Sam Dekker led Wisconsin (16-3, 3-3) with 20 points and six rebounds. Nigel Hayes added 12 points, and Frank Kaminsky and Josh Gasser had nine points apiece. But the conference’s best 3-point shooting team never held the lead, unable to get that perimeter game going. The Badgers finished 5 for 20 from behind the arc, and didn’t fare any better around the basket. Letting the Gophers do almost whatever they wanted inside, whether throwback post moves or drive-and-dish layups, the Badgers were outscored 48-24 in the paint. "You can’t give up one thing and then turn around and shut that off and give up something else," coach Bo Ryan said. "It’s got to be the complete possession. That’s what we haven’t been doing." Mathieu has a deftly effective, floating jump shot in the lane that he used on back-to-back possessions sandwiched around a steal by the Gophers to push their lead to 61-49. A few minutes later, the old arena rocked as loudly as it had all season when Austin Hollins soared over the defense to drop in a one-handed slam from the baseline and draw a foul with 5:54 left. The three-point play put Minnesota in front 66-54. "It’s just miscommunication there on that one," Dekker said. "Two guys went separate ways, and Hollins got in there for the big `and one.’ That’s the story of how it’s been the past few games. It’s something we have to correct." The early equalizer for Minnesota was two quick fouls on the 7-foot Kaminsky, whose absence left Wisconsin at a serious size disadvantage underneath. With just 2:32 elapsed, Kaminsky, the team’s second-leading scorer and the conference’s top 3-point shooter at 46.8 percent coming into the game, was on the bench. Walker took full advantage, powering his way past Hayes, Vitto Brown and anyone else assigned to stop him. The 6-foot-10 junior, who lost more than 60 pounds over the spring and summer so he could keep up with Pitino’s fast-break style and stay on the team, surpassed his career high in scoring less than 10 minutes into the first half. "I think he’s starting to kind of settle into his new body," Pitino said. "Confidence is a huge thing, and he’s got it right now." Last season, these teams split the series, scoring a mere 200 points combined in 85 minutes. Minnesota won in overtime at home 58-53, and Wisconsin won 45-44 on its own court. This is a different Badgers team, though, by far the most productive offense of Ryan’s 13 stellar seasons. Ranked as high as fourth in The Associated Press poll last week, the Badgers started a program-best 16-0 before hitting a snag last week in this strong-as-ever league. The last time they scored as many points per game (75.8 entering the night) as they have been averaging this winter, future NBA star Michael Finley was wearing a Wisconsin uniform. Ryan fell to 16-6 against Minnesota. This is only his fifth losing streak of three games or more since arriving at Wisconsin in 2001. The last one came two years ago. "We’re scoring, fine, but when you don’t get stops it doesn’t matter," Gasser said. The Gophers will have to be careful about a letdown Sunday at Nebraska, where Ohio State just lost, but this marked the end of a grueling stretch that — judged by AP rankings — was the toughest four-game set they’ve faced since 1987. That year, they lost all four against top 15 foes. This time, they split. "We can’t get our egos up from this win because the last time we got a big win like this over Ohio State we went and got beat by like 20 by Iowa," Mathieu said. "We’ve got another big road test."